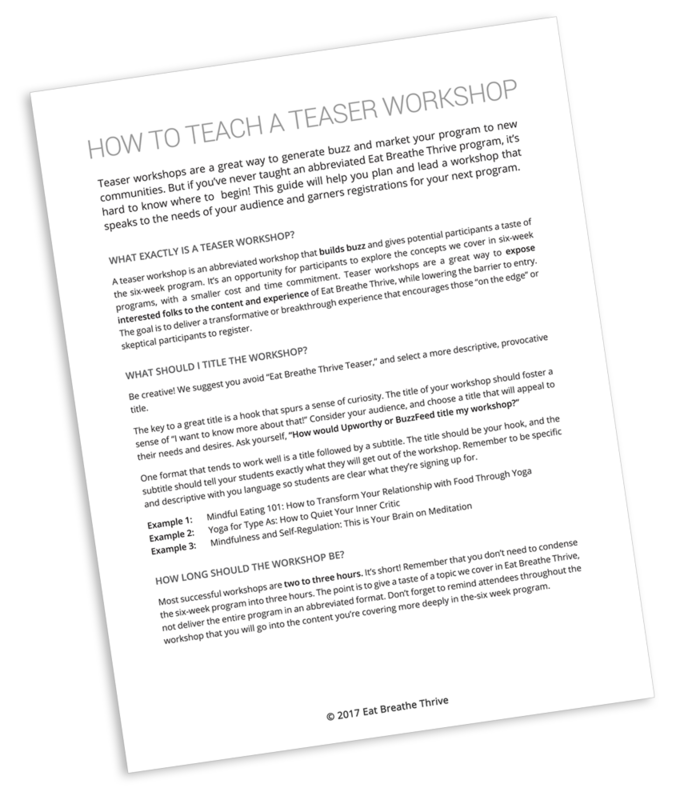 Discover tried-and-tested tips for teaching a teaser workshop to generate buzz and market your program! Teaser workshops are a great way to generate buzz and market your program to new communities. But if you’ve never taught an abbreviated Eat Breathe Thrive program, it’s hard to know where to begin! Which exercises and parts of the curriculum should you include? What’s a reasonable price point for the workshop? Explore an example curriculum and schedule for a teaser workshop. Identify reasonable price points for workshops of various lengths and topics. Create an action plan to fill the workshop and broaden your community. How to Offer a Teaser Workshop from Eat Breathe Thrive on Vimeo. Prefer to listen on-the-go? Download the audio file below!